From JC Gillyard of Guyton, Georgia on 3/1/2019 . The Europen Nightcrawlers were lively upon delivery. They have adapted well. However, I still question if there were 500. From Anonymous of Colbert, Oklahoma on 2/22/2019 . From Anonymous of SUTHERLIN, Oregon on 2/22/2019 . I have purchased a lot of worms and the European Nightcrawlers was my best purchase. I troll for trout and the size of these Nightcrawlers is perfect. The only drawback is the shipping cost. From Anonymous of oakaland, California on 2/9/2019 . Order European nightcrawlers. Arrived as stated all adults worms no babies, in good condition. From Nikolle Esteban of Aldie, Virginia on 2/7/2019 . I am very pleased with the service of Speedy Worm! They notified me of the delayed shipment and did not risk shipping the worms during the snow cold weather, which I greatly appreciated when I received healthy, live worms! From Anonymous of Minnetonka , Minnesota on 1/31/2019 . The communication on delivery status was perfect. The worms were alive and survived a frigid winter delivery! Popsicle the Muscovy Duck was THRILLED to get this special treat! From larry wickline of tacoma, Washington on 1/17/2019 . From jim of sterling, Illinois on 12/31/2018 . From Brenda Case of Candler, North Carolina on 12/13/2018 . All were alive even with the extra day of shipping and bad weather. From Carmen Haines of The Dalles, Oregon on 11/24/2018 . The order shipped right away and delivered on time. All worms are healthy and active. I put them in my form farm box and they are eating up the food. The price was great. I have to feed twice as much to the ducks bc they are European nightcrawlers but they are a great quality of worm. From Denny S of Denver, Colorado on 11/16/2018 . From Christopher Mackey-Natz of Fall Creek, Wisconsin on 11/16/2018 . I would not shop anywhere else! From Joseph Norton of Chico, California on 11/15/2018 . Very nice size vibrant worms. Customer service prior and post purchase 5 Star. Rapid delivery! ***Suggestion: Pick up at Post Office so worms go through a lot less jarring and stress or else they will be lethargic for a few days. Use moist soil for hydration. From Anonymous of Steinhatchee, Florida on 11/2/2018 . From Linda of Youngstown, Ohio on 10/27/2018 . The worms came very healthy and our bird loves them! They are very large and I'm very satisfied with the order! I also ordered wax worms which were also large and healthy!! I will definitely reorder! From RC Austin of Saratoga, Arkansas on 10/26/2018 . I have raised worms for over 15 years (RED) shipping all over the United States, and I have ordered worms from many places, and question most of the time, did I get the number of worms that I ordered. With Speedy Worms, I know that I have more than I ordered. We don't ship worms any more. If I had only one word to say about Speedy Worms it would be, AWESOME. From tuck3685 of UNION, South Carolina on 10/19/2018 . From Mark of Mulberry fla, Florida on 10/19/2018 . From Anonymous of Montgomery Co., Arkansas on 10/11/2018 . New to acquiring bait by mail. Had no idea what to expect. Got quite a laugh when I got a pink delivery notice in my mailbox with words " LIVE WORMS " on notification: ). Had to wait a couple of days before I was able to pick them up at USPO. Was a bit concerned about the wait, but worms were well packed and in good shape when I picked them up. They dived right in to bedding. Couple of days later I took them fishing and they wriggled quite seductively on the hook. Gonna provide a lot of relaxing time fishing. Thanks for good product and service. Also enjoyed the looks I got from ladies at office when collecting paper from the office shredders for preparation of "worm home". Glad I live in rural South! Thanks again! From Paul Stroope of Ozona, Texas on 10/4/2018 . I ordered 2000 worms they arrived right on time and I have had them in a box for over a week, worms are alive and growing. I WILL BUY FROM SPEEDY WORMS again. well worth the money. From Jeff Prado of Amarillo, Texas on 9/30/2018 . From jim liberi of tabernacle, New Jersey on 9/23/2018 . product quality as advertised,followed the instructions and are having total success. From Anonymous of Sergeant Bluff, Iowa on 9/22/2018 . High quality worms. Panfish love them, and my kids love panfish. Easier to care for than Canadian crawlers. From Trace Ellward of Brainerd, Minnesota on 9/15/2018 . The Worms were of Excellent grade. SpeedyWorm even changed shipping couriers to make sure that their product arrived in the best way possible. Very creditable source of worms.--Excellent Worms!! From Megan Traxler of Duluth, Minnesota on 9/14/2018 . Great! Came in about a day and I added them right to my worm bin! I use them as food for my axolotls. They got out of the bin the first day so that was an experience! But thanks for the speedy delivery! From Thomas Pruitt of Wesley Chapel, Florida on 9/6/2018 . Price for worms, good ...shipping , to me, a bit high and I had to go 12 miles each way to my post office to get them. Mostly understandable but I need to add $6 bucks more to the total for the gas. Worms are good and healthy but the last ones I put into my worm farm boxes either died out or found a way of excape. As for now ...so far.....so good. From thomas s foster of TUCSON, Arizona on 8/31/2018 . right on time and the exact right number and no fatalies. From Shyama Nandakumar of Ann Arbor, Michigan on 8/20/2018 . Worms arrived within 48 hours of ordering, in great health. Would recommend! From Donald Stidams of Columbus, Ohio on 8/17/2018 . From chris conrad of hamilton, Michigan on 8/16/2018 . This is my first time trying to start a worm farm. I want them for fishing and garden compost. First night I left the top off, large mess in the morning. Second night put the top on and was still shocked how many got out of the air holes. Still learning, but after losing half my worms I think I have it mostly figured out. Worms seam to be doing very well. From JMRS of Richton, Mississippi on 8/10/2018 . From Bill s of Bowerston, Ohio on 8/9/2018 . From Anonymous of Bowerston , Ohio on 8/9/2018 . From Anonymous of Lake Villa, Illinois on 7/21/2018 . From Chris Zettlemoyer of Oreland, Pennsylvania on 7/5/2018 . From John Mathis of Winter Springs, Florida on 7/5/2018 . Arrived alive in good shape. Got the call in early AM of 3rd day. From Michael Aziz of Boston, Massachusetts on 7/4/2018 . Speedy Worm sent us 500 of their best worms to use for a kids' fishing derby. We ordered them well in advance of the derby. But Speedy Worm tracked it, shipped it out on time, and the worms were delivered to us nice and healthy! Thank you Speedy Worm!!! We appreciate your Support! From Anonymous of Loyalton, California on 6/30/2018 . First time around the USPS failed to deliver for 10 plus days. Worms arrived dead, package full of maggots. Customer service came through and resent my order for 500 worms. They arrived in 3 days. They were in good shape. Thank you customer service. From Jack of Annandale, Minnesota on 6/24/2018 . The crawlers were just adorable looking and succulent. We've never had nicer ones. Pan fried or grilled, mmmmm! They might even be good for fishing. What more can I say about night crawlers??? From Bill Tran of Auburn, Alabama on 6/16/2018 . Bought them for my box turtle. The worms all came alive and healthy. The seller decided to have the post office hold the worms for me due to inclement weather in my area. Would recommend it. From Mark Dougherty of Kansas City, Kansas on 6/15/2018 . Extremely pleased with my order of 250 worms and so are my fish! Healthy, fresh worms and way cheaper than buying at the pet store or bait shop! Definitely going to be ordering more! From Anonymous of Hot Springs , Arkansas on 6/14/2018 . Ordered twice now, both times worms arrived live, “wiggly” and ready to go! From Jerry Nowak of Lee's Summit, Missouri on 6/9/2018 . The worms arrived alive even though it was 90 degrees outside. The box had four holes in it. I put them in a Styrofoam container with prescribed bedding and they seem to be doing ok. I think it is too early to know if the desired progress will be achieved. From scott s of CHIPPEWA FALLS, Wisconsin on 6/1/2018 . From Simona Vanecek of Sacramento, California on 5/31/2018 . From Sandra McHargue of Palo Verde, California on 5/31/2018 . Very friendly customer service. Shipping was quick and on time. Nightcrawlers arrived alive and well and good sized. I would highly recommend using speedyworm for your worm purchases. From Sarah Anderson of Snohomish, Washington on 5/25/2018 . Our order came fast and the worms were healthy and lively. We are very happy with Speedy Worm! Thanks! From Mickey of San Bernardino, California on 5/19/2018 . I'm happy with my worms. They are a lively bunch and I'm looking forward to seeing them multiply and help my garden grow. Fast shipping. Arrived in a marked box with air holes so the carrier knows to be careful. I will definitely buy more. From Anonymous of Winona , Minnesota on 5/18/2018 . Ordered 1000 euros, sent on Monday delivered on Tuesday, well packaged and labeled. 1000 live worms unpacked and doing great...Highly recommend! From Dolecki of Freehold, New Jersey on 5/17/2018 . Worms arrived alive and heathy looking. From Mike Horvath of DESOTO, Texas on 5/10/2018 . Received in good shape, despite warm temperatures. From Kenneth Arbuckle of Jefferson, Iowa on 5/5/2018 . Very lively.Easy access bag good for bank fishing. From GZ of McDonald, Pennsylvania on 5/3/2018 . Excellent size, plump and full of life. Can’t wait to catch some big large mouth bass.....or “any fish” that comes along. Best online worms I ever bought. From Randall Adkins of Seneca, South Carolina on 4/29/2018 . From Kathy Garcia of Lafayette, Colorado on 4/28/2018 . Worms arrived quickly and were alive and healthy. Great service and product. From Anonymous of IRVINGTON, New Jersey on 4/28/2018 . CAUGHT MY LIMIT OF RAINBOW TROUT USING THE EUROPEAN NIGHTCRAWLERS, QUICK HARD BITES! From Anonymous of Lubbock, Texas on 4/24/2018 . The order was swift in getting to my email, the worms arrived when projected and in good condition. The overnight was great. A good experience. From Thomas Pruitt of Wesley Chapel, Florida on 4/20/2018 . I didn't count them, but I received a big bunch (100 promised) of large, healthy night crawlers. Price is very good....but shipping seemed a bit high. All in all I'm satisfied. From John Smith of Pendergrass, Georgia on 4/15/2018 . Received the worms very quickly. All the worms were alive and looked very healthy. I used a few for fishing and they worked just great. I recommend these worms for fishing. Great product. From Martin Lyons of Horton, Michigan on 4/14/2018 . From Anonymous of Irvington, New Jersey on 4/13/2018 . Perfect size.... these babies attract trout, I love em! From Robert Hancock of mesa, Arizona on 4/12/2018 . The night crawlers arrived on time in excellent shape.They are doing great .Thank you keep up the good work. From John of Charleston, South Carolina on 4/6/2018 . Very happy with delivery and product. Looking forward to harvesting more. From Mike Horvath of DESOTO, Texas on 4/5/2018 . From John McLuckie of LANARK, Illinois on 4/5/2018 . They all arrived in good shape and on time. From Jeff Walsh of Dickson City, Pennsylvania on 4/5/2018 . From Stan Czenis of Ewing, New Jersey on 3/30/2018 . From George Beamon of Norfolk, Virginia on 3/29/2018 . From Sharice B of Orlando , Florida on 3/23/2018 . The worms arrived in perfect condition and were very lively. They plumped up to their full size in about 24 hours. They made a seamless transition to their new home and have been in a feeding frenzy. Thank you Speedy Worms, we will definitely order again soon! From larry myer of missouri valley, Iowa on 3/22/2018 . From Jason of Payson, Utah on 3/2/2018 . Very healthy, lively worms. Quick shipping, too. Very happy. From Teresa Nolan of Twentynine Palms, California on 2/28/2018 . From Dan of PUNTA GORDA, Florida on 2/15/2018 . From Melissa VanDeest of Dike, Iowa on 1/31/2018 . customers love these, i will be buying more! From Anonymous of Honea Path, South Carolina on 1/19/2018 . From Anonymous of VILLISCA, Iowa on 1/14/2018 . From Christopher Mackey-Natz of Eau Claire, Wisconsin on 1/2/2018 . Ordered 2000 European Nightcrawlers for my 7th grade class. Great customer service and great crawlers! Thank you Speedy Worm! From JOSHUA OLLIFF of los angeles, California on 12/15/2017 . AA++++ sassy and alive, they've kept for a week so far, very pleased. From wwjdbjc of Cottage Grove, Minnesota on 12/12/2017 . The worms were the perfect size. The fish loved them. My only complaint was the speed of delivery. The delivery date given was 3 days. The website states for MN there is a good chance that it could be 1 day shipping. I ordered on Sunday night. I received a shipped email Monday afternoon. It took until Friday afternoon to receive the worms. I will order again. Well worth the money. From James Albey of Malvern, Arkansas on 12/1/2017 . I highly recommend Speedy Worm as their European Nightcrawlers and Their Delivery Service can’t be beat in my opinion. This is my second order of 2000 in two years time. First order was reproducing great until they were invaded by a colony of ants and totally wiped out in 48 hours. Thanks Speedy Worm. Great Company, Great Product!!! From Anonymous of Sarasota, Florida on 11/23/2017 . All the worms were in excellent condition and are doing well. Thank you! From Deb of Springfield, Kentucky on 10/27/2017 . Second time ordering from speedy worm. Worms arrived very well packaged and alive and well. From Anonymous of Port St Lucie, Florida on 10/27/2017 . Arrived ahead of schedule . All alive . Worms are vibrant and full of life they have settled nicely in their bed. From Candace Galen of Columbia, Missouri on 10/20/2017 . Night crawlers arrived ahead of time and there were more than the 500 we needed for our Ecology lab. Thanks Speedy! From Rut taylor of Springfield, Missouri on 10/6/2017 . From Roger of whitesville, Kentucky on 9/28/2017 . As always Speedy Worm delivered very lively quality worms that is why I have ordered their european crawlers for many years and plan to for many more. From Anonymous of Perry , Missouri on 9/28/2017 . Best worms I've used in a long time. Live delivery and big worms. From Anonymous of Winston-Salem, North Carolina on 9/28/2017 . Worms arrived in excellent condition, are thriving in their new home. Great value and service, thanks! From Anonymous of Graettinger , Iowa on 9/12/2017 . Arrived on time, in great shape and caught lot of fish! From Anonymous of Pierceton, Indiana on 9/1/2017 . Ship on time in great shape. Work great.No complaints. From John McLuckie of Lanark, Illinois on 8/28/2017 . Good crawlers, you actual sent bait crawlers, where other send bed runs and call them bait crawlers. THANK YOU! From DAVID ASHLEY of ROUND ROCK, Texas on 8/26/2017 . These at great lookin worms box turtles ,blue tongue skinks love em !! From F.L.Trostle of Briggsville, Wisconsin on 8/25/2017 . Worms arrived alive and on time. worm farm and for fishing. From Terry Linebarger of Salem, Missouri on 8/24/2017 . Worms were delivered on time and alive as advertised. Ordered through USPS and the handling was very good. Worms were in very good condition when they arrived! Will buy again! Thanks! From Maria Munoz of Mcallen, Texas on 8/24/2017 . worms came in as expected ...my mails man left them inthe heat for a whole day inside a locker and texas sun aint no joke.....next day i got them i shocked to see all worms ALIVE. From Isaac Shanley of Platteville, Wisconsin on 8/11/2017 . Products were delivered when stated would be and were in the condition they should be. Will be sure to use your company again. Thank you. From STEVEHILLS99@YAHOO.COM of RIVERSIDE , California on 8/11/2017 . 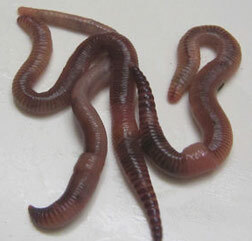 I ORDERED THESE WORMS TWICE LAST YEAR AND PUT THEM IN FRIG IN THE SHIPPING BAG THEY CAME IN AS SOON AS THEY ARRIVED. BOTH SHIPMENTS STAYED ALIVE AND HEALTHY FOR SEVERAL WEEKS AND CAUGHT FISH. THIS YEAR I PURCHASED ANOTHER SHIPMENT WHICH ARRIVED IN LATE JULY AND I PUT IT IMMEDIATELY INTO THE FRIG IN THE SHIPPING BAG IT WAS DELIVERED IN. A WEEK LATER I TOOK THE WORMS FISHING AND FOUND ALL OF THEM TO BE DEAD AND DRIED OUT. I CALLED YOUR OFFICE THE NEXT DAY AND WAS TOLD THAT I DID NOT HANDLE THE WORMS PROPERLY- I WAS TOLD BY THE SLAES REP. THAT I WAS SUPPOSED TO TAKE THEM OUT OF THE SHIPPING BAG AND PUT INTO ANOTHER CONTAINER WITH A SMALL AMOUNT OF WATER AND TO NEVER STORE THE WORMS IN THE SHIPPING BAG THAT THEY WERE SENT TO ME IN. I WAS REQUIRED TO PAY IN FULL FOR ANOTHER SHIOMENT AS IT WAS MY FAULT THAT I DID NOT STORE THE WORMS PROPERLY. THERE WAS NO MENTION OR DIRECTIONS IN THE SHIPMENT TELLING ME HOW TO STORE THE WORMS. I RELUCTANTLY RE-ORDERED ANOTHER SHIPMENT WHICH WHEN IT ARRIVED I PUT INTO ANOTHER CONTAINER, ADDED WATER , AND THEY ARE DOING FINE AND AWAITING THEIR FATE. STILL NO DIRECTIONS IN THE SHIPMENT ABOUT HOW TO HANDLE THE WORMS OTHER THAT THEY DONT REQUIRE REFRIGERATION. From nancy brause of kingston, Massachusetts on 8/10/2017 . From j. carricaburu of cokeville, Wyoming on 7/29/2017 . Service Rating Over the top!!! From Daniel Blakeman of Sevierville, Tennessee on 7/28/2017 . I ordered worms for the first time during the hot part of our season here. Temps running 91 to almost 100 degrees. I was concerned about shipping and didn't want to pay for overnight rates. Sent an email and asked my question about shipping because of the experience this company has in delivering their products. I was totally amazed at the suggestion given me and received my worms in perfect condition as stated. I didn't loose one worm, healthy, fat, gorgeous worms...LOL I will by all means recommend and reorder from these people any time I want more worms. They go beyond in their effort to please their customers and help them get their products in great condition. Can't rate them high enough AAAAAAAAA+++++++++++ Plus Awesome company. From James Saeger of WAVERLY, Virginia on 7/21/2017 .